U.S. ad spending declined nine percent in 2009, according to preliminary figures released today by The Nielsen Company. Spending fell an estimated $11.6 billion to a total of $117 billion last year. The figures continue a trend of at least six straight quarters of negative growth in the ad industry, but it’s a trend that shows evidence of slowing down. 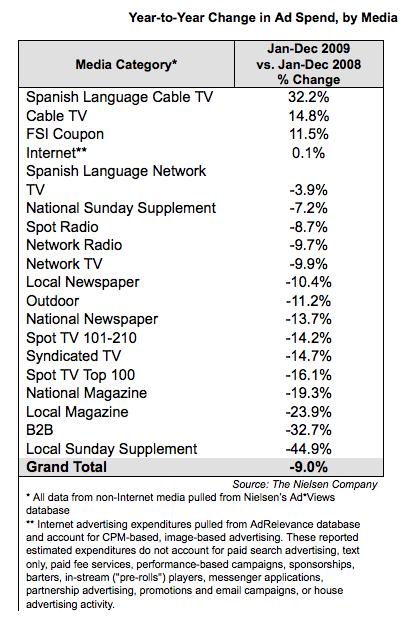 In the previous two quarters, Nielsen reported declines of 15.4% and 11.5%. With a contraction in spending of 44.9%, the Local Sunday Supplement’s days may be numbered. This entry was posted on March 1, 2010 at 7:14 pm and is filed under Marketing Communications, Search Engine Marketing, Search Engine Marketing Firm, Search Engine Optimization, Search Engine Optimization Company, Search Marketing, Year To Year Ad Spend By Media. You can follow any responses to this entry through the RSS 2.0 feed. You can leave a response, or trackback from your own site.